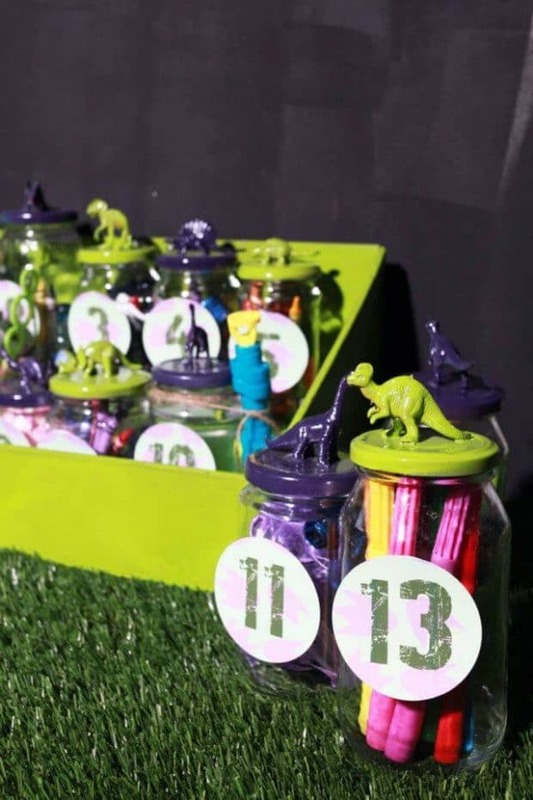 Take a journey back in time with a boy’s dinosaur themed birthday party! 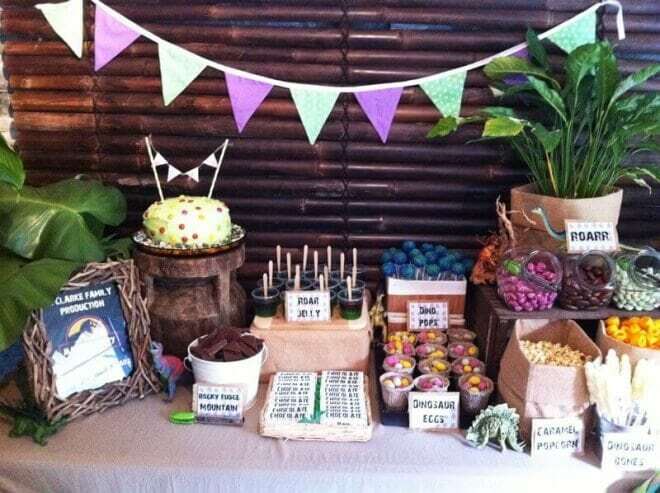 Justine, from Sensationally Sweet Events, threw an awesome prehistoric themed party for her son’s fifth birthday. And boy, does she know how to throw a party. 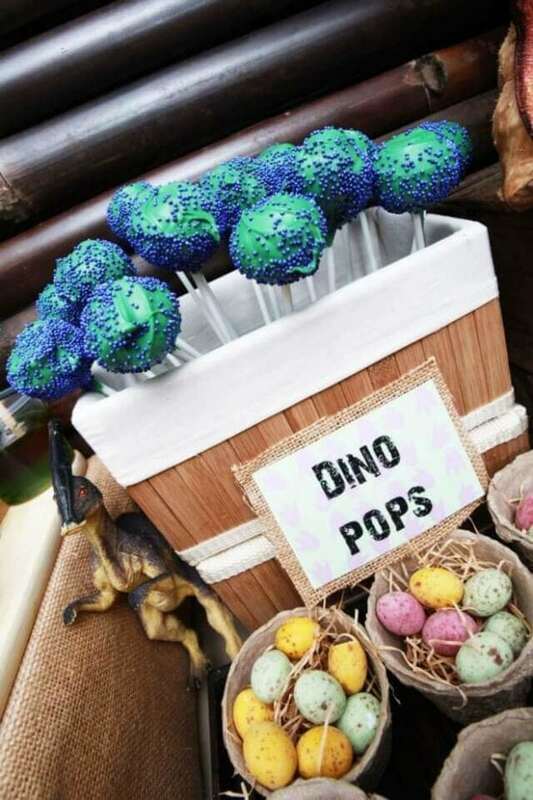 On a dessert table with everything from Dino Water to Dino Cake Pops, the party food and dino decorations are sure to make party guests roar. 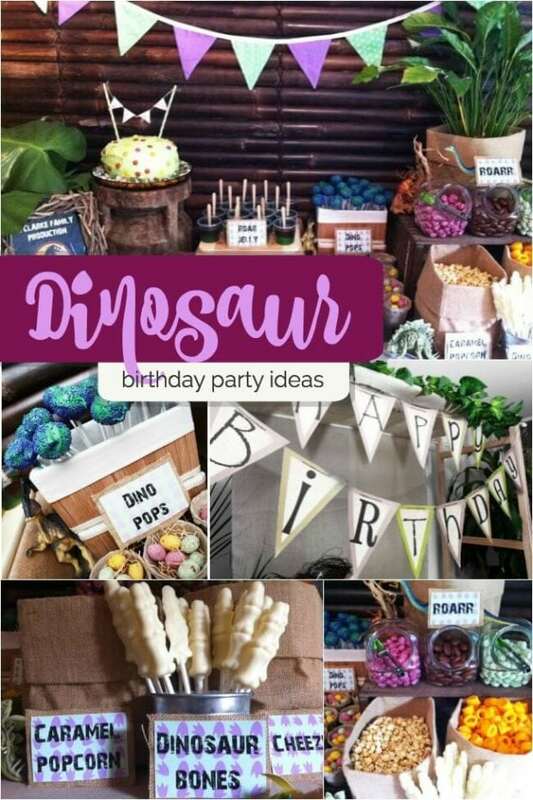 Check out this Jurassic World Inspired Dinosaur Party for great inspiration for your next dino themed bash. 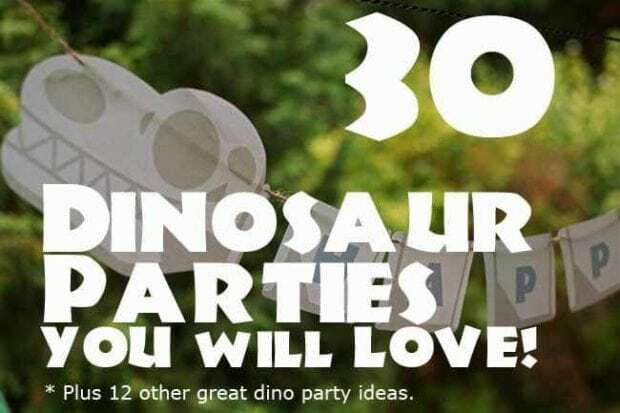 Kids will love these 21 Dinosaur Party Craft Ideas that are perfect for parties and just a rainy day. The color scheme evokes a natural outdoor dino environment, drawing on earth tones of tan, brown, and green. Notice how all the food and drinks are decorated with labels made with dinosaur inspired fonts, framed with burlap fabric—a terrific detail. When it comes to the birthday cake, the fun is in the decorations. 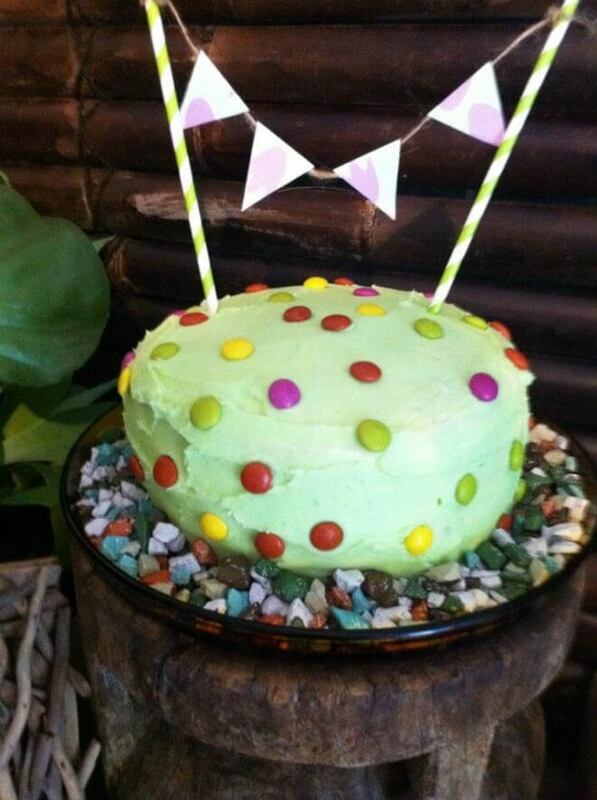 The green icing is dotted with candy dino eggs and the plate is rimmed with candy rocks (fossilized?!). Festive dino paw print banner flags top it off. Even the cake stand looks prehistoric! Justine had a lot of fun with the desserts. 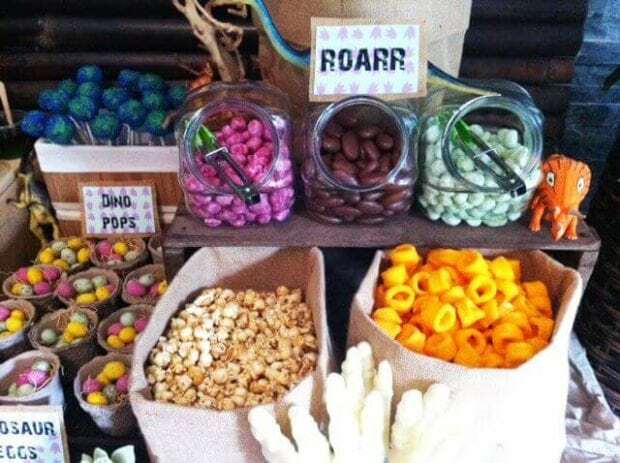 There are dino cookies, a variety of candies, burlap sacks filled with crunchy caramel popcorn and cheese rings. 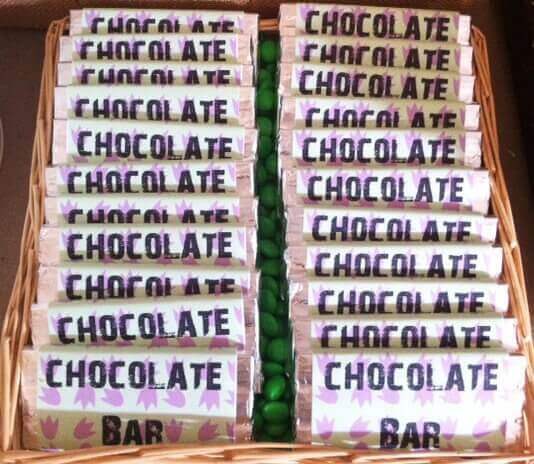 Imaginative Dino Bone white chocolate treats, chocolate bars, and Dino Pops are ready to be devoured. Dinosaur nests are filled with candied dinosaur eggs. I love how Justine arranged dinosaur figurines and dinosaur photos throughout the room. Hiding amongst the food, framed images of dino eyes and dino paws are fun surprises. 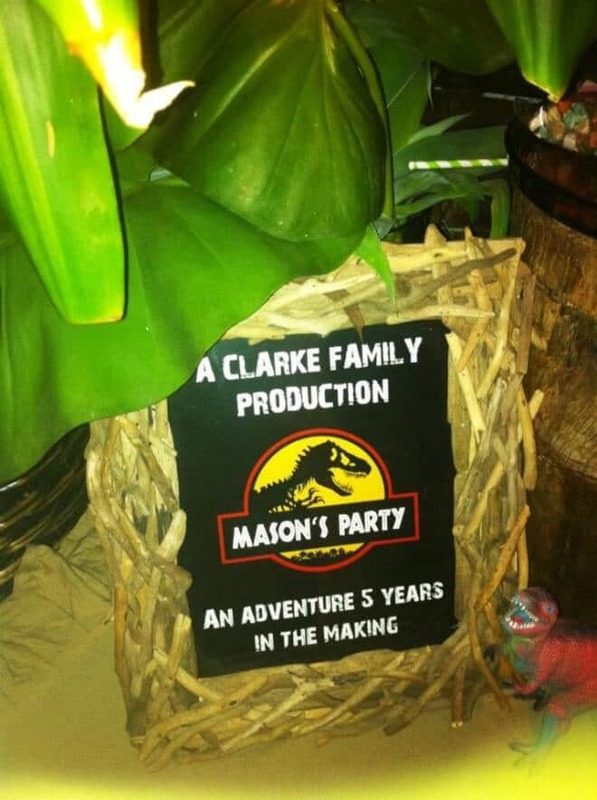 Did you see the Jurassic Park-inspired movie poster with the birthday boy’s name displayed in the twig frame? That adds a great, personalized touch. 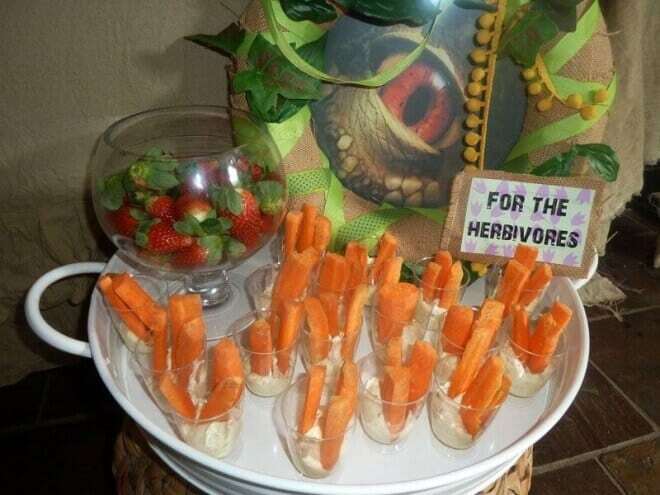 Justine didn’t forget about herbivores at the party. Individual cups filled with veggies and dip, and a bowl full of strawberries, are great for munching. Guests went home with jars filled with colorful markers; Justine glued dinosaur figures on the lids and spray painted them purple and blue. What a great way to end a dinotastic party for a special birthday boy! 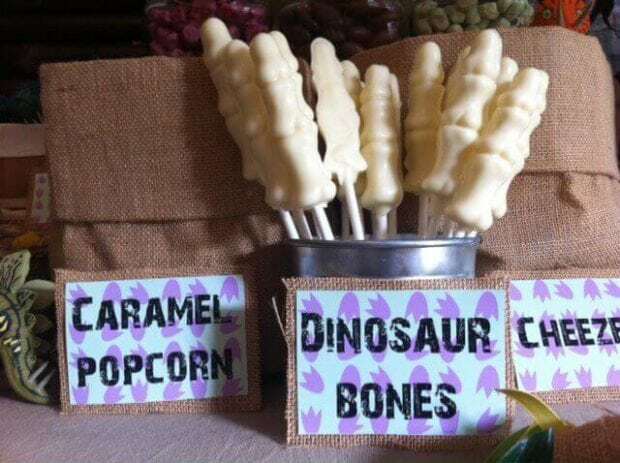 Be sure to check out more dinosaur party ideas here.